I love these. Could eat all on my own easily. Which would be really bad obviously. So delicious. p.36. Very good. Looking forward to trying the sauce with mint in addition to cilantro and parsley. I just used one large egg, separated, beating the yolk well before combining with the other batter ingredients (also, like others, didn't bother with the self-rising flour). To make these less of an undertaking, do more than half the work a day ahead: get the vegetables cooked and mixed with the spices, and mix up the sauce. Then the day of it's more or less like making pancakes. Update: Leftover sauce is outstanding as garnish for roasted red pepper-tomato soup; the soup brings out the cilantro and tones down the garlic. Very tasty. I would have been happy to eat all of the fritters myself! I substituted mint as I didn't have any fresh parsley at hand. Instead of blending the dipping sauce I chopped the ingredients finely. Use 1tsp baking powder. Fantastic. I dramatically reduced the fat (about 3 Tbs. olive oil + 2.5 Tbs butter, plus the oil to fry), added an extra egg white, and was happy with the results. I made them smaller than recommended, and they cooked through nicely, fluffy in the middle, crispy on the outside. I subbed mint for the cilantro in the sauce and served with curried chickpeas. Lovely. I didn't use self-rising flour as I didn't have any, and there is already a tablespoon of baking powder in the recipe. I don't think that made any difference. It takes quite some time to prepare these and I am not sure they looked like all the work that went into them. They were pretty good though, especially the sauce, which is actually quick to make. One could also make them much smaller to share with a larger group of people. Pg. 36 The sauce that he recommends as an accompaniment is absolutely delicious and would go very well with any number cut veggies. 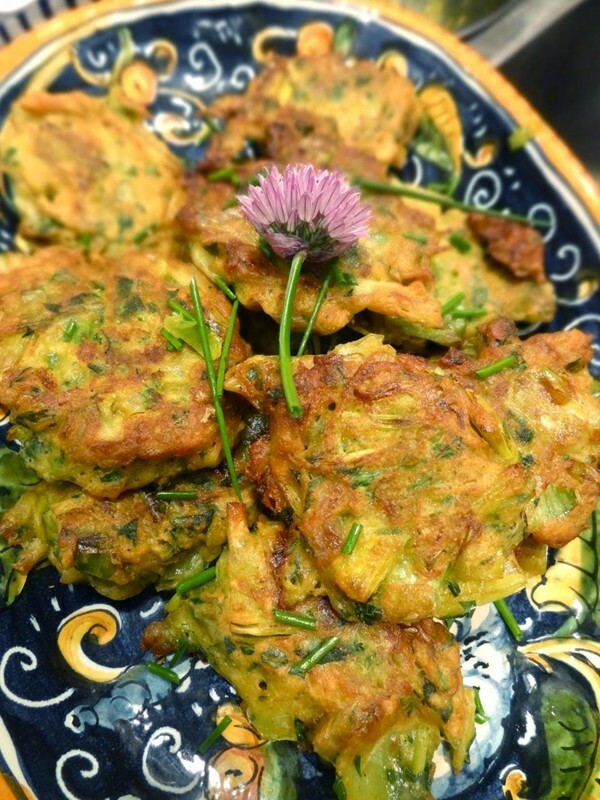 The fritters are also very tasty, with the distinct flavour of leek and shallot, the extra crispy bits made me think of onion rings. Also, the seasoning is just right, with several interesting spices. My only challenge was they they were a little doughy in the middle. This might be the result of having them sit in the warming drawer, being slightly underdone, or just too big. I think next time I will make them a bit thinner, leave them to cook a little longer, and keep warm on a rack in the oven so that they hopefully stay crispier.